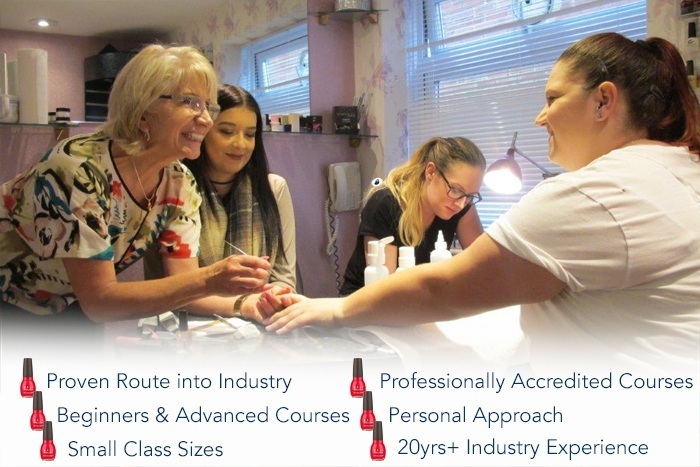 Our 4 day, all inclusive, accredited course is designed as a thorough route to achieving a nail technician qualification. 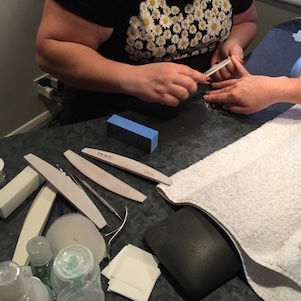 It combines all the essential skills required to safely apply nail enhancements in UV Gel or Acrylic. No previous skills or experience are required and once qualified and insured you will be ready to start working. Don’t see a date to suit you? Give us a call, we often run extra classes. What’s included in the price of your course? Professional student kit (enough product for up to 40 sets of nails). A quality, branded UV Gel lamp is included for UV Gel course only. Comprehensive handouts and training notes. * The loan of a practice hand is included in the price of the course. However, a deposit of £100 is required and this will be fully refunded to you when you return the hand at the end of the course If you prefer, you can purchase a practice hand at a cost of £100.00 and obviously it is then yours to keep. Acrylic £575 and UV Gel £725 (including all product kits, training notes and certification) Please note models* are required at 1pm on both day three and day four. * Acrylic and UVGel when correctly prepared and applied are hygienic, safe and reliable. Both are equally strong and beautiful. Once qualified in either you may add the other via a one day conversion class. The Nail Academy uses only world renowned, top quality products. Our primary focus is to ensure that you are trained to the highest standard.